// Load a Landsat 8 image and select the panchromatic band. // Compute the image gradient in the X and Y directions. // Compute the magnitude of the gradient. // Compute the direction of the gradient. Note that gradient() outputs two bands: the gradient in the X-direction and the gradient in the Y-direction. As shown in the example, the two directions can be combined to get gradient magnitude and direction. The magnitude should look something like Figure 1. Figure 1. 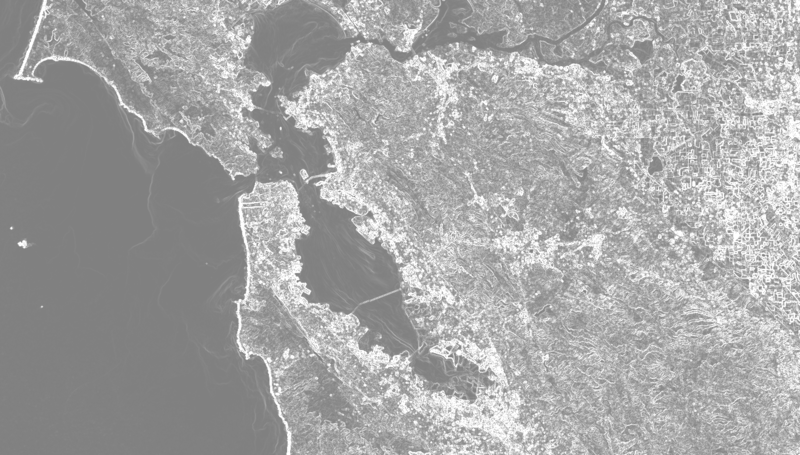 Panchromatic gradient magnitude for the Landsat 8 imagery over the San Francisco Bay area, California, USA.